I think that, despite people’s dislike of the Turkinator achievement, this is turning out to be a great holiday. There are daily quests, reputation bonuses, a cute pet, and the opportunity to level a skill many people find tedious and skip entirely. Yes, one of my favorites – Cooking. You can powerlevel Cooking on any of your characters up to Outland levels with little effort, and Northrend levels with a bit more. All of this for any of your characters, no matter what level they are. Yes, you read that right. 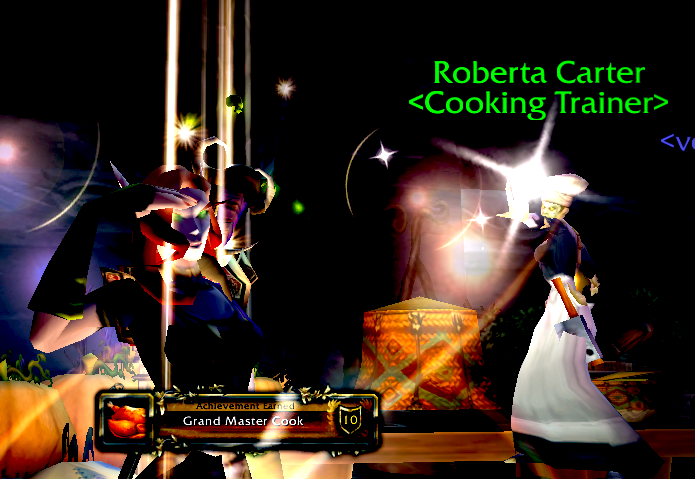 Any character can be a Grand Master Cook, regardless of level, and this holiday makes it easy. As someone who powerleveled Cooking and Fishing together the old way, over the course of several days, this change is awesome. Take advantage of the opportunity and level your alt’s skills now. The strategy is quite simple. Start in either Elwynn Forest or Trisifal Glades, depending on your faction, and empty your bags as much as possible. If you want to collect all the mats up front and then cook, you’ll need 68 slots open. You will need to make 4 stacks (80 units) of each of the various holiday dishes. So, you’ll need 80 each of: Simple Flour, Mild Spices, Ripe Pumpkins (Alliance, Horde), Tangy Cranberries (Alliance, Horde), Sweet Potatoes (Alliance, Horde), and Wild Turkey meat. You will also need from the holiday vendors: 1 Bountiful Cookbook, 16-17 stacks of Autumnal Herbs, 20-22 stacks of Honey. Open the cookbook to reveal the recipes you’ll use. Start off by training Cooking and Spice Bread. You don’t need any other recipes yet, as they’ll just clutter your Cooking interface. You can always go back and learn them later. Make a Basic Campfire and start cooking Spice Bread. This will go green around 30, but you’ll need all 4 stacks for the next step, so keep going even if it goes gray. Cook Spice Bread Stuffing until your skill reaches 50. At that point, go train the Journeyman Cook skill and go back to making stuffing. This recipe goes yellow at 90 and green at 100; I’ve found you should end somewhere around 105-110. Learn the next recipe, Pumpkin Pie, and start cooking it until your skill reaches 125. Go train the Expert Cook skill and make the rest of the pies. Pumpkin Pie goes yellow at 150 and green at 160, just in time for the next recipe. You might need to switch cities at this point if you don’t have all the materials (Ironforge for Alliance, Orgrimmar for Horde), but you want to learn Cranberry Chutney and start cooking it. Train your Cooking skill at 200. This recipe will go yellow at 210 and green at 220, but make all 4 stacks. Again, if you don’t have all the mats, you’ll need to relocate to Darnassus or Thunder Bluff, but follow the same pattern for Candied Sweet Potatoes. I love Sweet Potatoes, and not just because they bring you up to about 280-300 Cooking. Cook everything you’ve got, but stop before you hit 300. Make sure you have 4-5 stacks of Wild Turkey and Autumnal Herbs, and 8-10 stacks of Honey, train Master Cooking, and then start making Slow-Roasted Turkey. If you have 4 stacks, you should get just about to 350; 5 stacks should take you past it. Once you’re at 350, train Grand Master and do a happy /dance! 2011 Update: Slow-Roasted Turkey will now stay orange well into the 400s. Once you’ve trained Grand Master, keep on going as long as you can! Even if you aren’t that organized and end up doing a lot of traveling and turkey hunting, this process takes about 1-2 hours, which is a far cry from the days it used to take using Fishing. Don’t forget that these items can’t be mailed, but they can be traded, so enlist the aid of some friends to serve as mutual material banks. (They work like conjured items.) High level mages can collect all the materials but the Wild Turkey meat in minutes, and friends can help you swap unused items over to different toons. Good luck. May your cuisine reign supreme! Let’s say you’ve been asked to kill 40 turkeys. I don’t know why, maybe a friend dared you to do it. And let’s say this friend said, not only do I dare you to kill 40 turkeys, I dare you to kill each one within 30 seconds of each other. You should have two responses. First, take this person off your friends list! What kind of friend would ask such a crazy thing of you? Second, bet them 100g on the spot, because you’re going to kill those turkeys AND get paid for it! Prepare yourself with some Tracker Snacks. If you can’t cook them yourself, find someone who can or buy them off the AH. Pay whatever outrageous prices people are asking, because time is money, friend! Go scouting. Don’t skip this step! Ride around and find 2-3 groups of turkeys, all close to each other. In Elwynn I found a LOT of these areas -around Stone Carin Lake, Ridgepoint Tower, Jasperlode Mine – I settled for the far side of the Eastvale Logging Camp and Ridgepoint Tower. I hear the area south of SM in Trisifal is also good, but the specific spot matters less than that there are lots of Wild Turkeys there right now. Now you’re going to make a macro. If you’ve never made a macro, now’s a good time to start. If you don’t like using macros, tough, because your reputation and money are now on the line. And it’s a simple one — Line 1: /target Wild Turkey, Line 2: /cast (instant-cast damaging spell). That’s it. Put it on your action bar. Put on your speed boots – you have speed boots, right? – put your pet on passive, and go hunting! Always be moving to the next yellow dot. Ride whenever you are not in combat, and run when you are. DO NOT STOP TO LOOT. Kill turkeys until you’re tired of killing, and then kill some more. Don’t stop until you get [The Turkinator]. /dance, then go kill 25 more Wild Turkeys – this time, loot them. You need the meat for quests. Once all that is complete, go find your friend, gloat, and collect your bet. Enjoy your shiny new achivement! I’ve come across several posts recently on battlegrounds that I thought you might enjoy. You’ve probably already seen this, but Battleground Independence at the always excellent DoTs and HoTs is worth your time. Cass asks some great questions about the role of a healer when DPS classes are able to be self-sufficient. I found Musings on lowbie battlegrounds to match my own experiences of late in the 19 bracket of Warsong Gulch. I am very much enjoying the low level PvP, and will be writing about that soon. The latest installment of Zach Yonzon’s series on WoW Insider, Absolute Beginner’s Guide to Arathi Basin, is a fine read. He does a great job of breaking down the basics and getting you ready for the Basin. Okay, this one doesn’t have anything to do with battlegrounds, but if you’re like me and have leveled Engineering into the endgame, it’s good to know you can still make gold with it. If you follow me on Twitter you know that I have a fondness for the Auction House and have a close relationship with my banker. Oh no, I’ve been tagged! I have been watching Death Goddess’s DPS Survey spread through many of the blogs I read with some interest, but as an infrequent raider didn’t feel like I had much to contribute. It’s a very raid-heavy questionnaire. However, Cassandri made an interesting request in her entry, asking that I balance out the raiding discussion with my PvP perspective. So who am I to decline such a nice request? I will substitute “battlegrounds” for “raids” whenever necessary, of course. What is the name, class, and spec of your primary dps? Cynwise is my Destruction Warlock. I am currently experimenting with three different PvP builds: a 0/20/51 Demonic Brutality build (for anti-melee big battleground fighting), a 0/20/51 Improved Succubus build (for smaller engagements) and a 0/17/54 Soul Leech build (for self-healing). I’m considering dropping my secondary raid spec and giving Affliction PvP (54/17/0 Haunt/SL) another try when 3.3 hits. Wintergrasp, followed by Alterac Valley, Strand of the Ancient, Eye of the Storm, and Arathi Basin. I’ve found I like those 5 battlegrounds the best but don’t run them in any particular preference aside from whatever holiday weekend is up. I sometimes run Warsong Gulch and Isle of Conquest for the daily, but they’re just not my favorites on my warlock. What is your favorite dps spell/ability for your class and why? I considered several non-DPS spells for this question — Demonic Circle: Teleport and Fear, especially — but in terms of my damaging spells, my favorite is Shadowfury. It’s not my highest damage spell, nor is it part of my damage rotation, but it is so incredibly useful in battlegrounds that I consider it the defining talent of a Destruction PvP warlock. Death Coil came in a very close second, because it is so full of awesome. Instant Horror, damage, and healing? More of that please! What dps spell do you use least for your class and why? Shadowburn. The Soul Shard requirements on it make it worthless in longer fights. It is good surprise DPS, but I can never justify the shard. It’s pretty sad that I can find a use for almost every other spell in my arsenal, but not this one. What do you feel is the biggest strength of your dps class and why? While I’m tempted to say damage — horrifying burst damage, terrifying DoT damage, maddening demon damage — I think it’s the wide variety of crowd control options available to Warlocks that makes us so strong. That change of attitude has made me a more effective combatant. What do you feel is the biggest weakness of your dps class and why? Warlocks are extremely vulnerable to melee who can close the gap. We are lacking in escape abilities, especially if your Demonic Circle isn’t down. The ability to maintain range is vital to surviving as a Warlock. In a 25-man raiding environment 40-man battleground, what do you feel, in general, is the best dps assignment for you? Setting aside that there aren’t formal assignments in the PuG battlegrounds we have today, I should ideally be out on the front lines, maintaining range and providing a combination of damage and fear-induced chaos. I should not be driving a vehicle or operating a cannon, because that is a bad use of my abilities. I do it when necessary, but it shouldn’t be my primary assignment. Riding shotgun on a Wintergrasp Demolisher is okay, because I can still cast as we move. What dps class do you enjoy dpsing with most and why? I pretty much like them all, as long as the players are good. Battlegrounds teach you to not be picky. What dps class do you enjoy dpsing with least and why? Honestly? I get a little irked when we are short on healers and I see hybrids who could heal the battleground, but aren’t. Healers are absolutely the most critical resource in a battleground. I will lay down my life repeatedly on a battleground for you if you are a healer. This is situational ire. If the healing is good, I don’t even look twice at Retribution Paladins running amok. Running the flag in Warsong Gulch as a feral Druid doesn’t make me blink. I know you can’t switch specs on the fly in an instanced battleground, and that you come as you are. I also know that hybrids bring awesome utility to PvP and that they’re hugely fun to play that way. But DPS doesn’t win battles. Healers win battles. What is your worst habit as a dps? Tab-targeting as Destruction. For Affliction it was great, but I should be more focused in my targeting now that I have to stand and cast. What is your biggest pet peeve in a group environment while dpsing? Players who attack my Seduced targets. Talented Seduction is a great way to escape from opponents, but not when it’s getting broken every GCD. Having someone attack my seduced target while trying to escape made me switch my talent build to Demonic Brutality and run with the voidwalker instead. Let me take a break from this questionnaire to bring you the scene that caused me to switch my talent build. It is set, as all good dramas are, in Alterac Valley, right outside Stonehearth Bunker. Ret Pally: Casts Judgement of Justice, closes to range, hits Cynwise. Ret Pally: No. You messed up my hair last time. Cynwise: Fear’s not going to work on you, is it? Do you feel that your class/spec is well balanced with other dps? Yes. As a class, Warlocks are viable threats in battlegrounds without being overpowered There are some classes that do better against us than others, but the reverse applies, too. Protection Warriors, Rogues, or a well-played Death Knight should have little trouble with a solo Warlock. Destro and Affliction are both stronger than Demonology in PvP right now. 3.3 is going to change the balance between the specs, so we will have to see if that equalizes the three trees. What tools do you use to evaluate your own performance as a dps’er? No, seriously. Battlegrounds are not about Recount, or DPS. DPS is a totally worthless metric in PvP. Total damage done on the scoreboard can be useful as a personal metric, but once you realize you have additional abilities you should be using to help win (*cough Crowd Control cough*) topping the leaderboard isn’t a good goal either. Instead, I focus on winning individual matchups. When I lose a matchup I try to review my combat log to see what my opponents did to win. I should note that evaluating my individual performance is very different from evaluating my team’s performance. When we win well I try to figure out what the team did right, and when we lose I try to figure out what went wrong. Sometimes I find myself staring at the scoreboard for the full 2 minutes trying to figure out who did what where. What do you think is the biggest misconception people have about your class? That we’re not fond of kittens. That’s not true. I love kittens. Especially braised with a light cherry sauce. What do you feel is the most difficult thing for new dpsers of your class to learn? The number of abilities you gain as a Warlock can be quite overwhelming, especially when trying to use them all in PvP. You have a lot of tools at your disposal as a Warlock; learning to pick the right one for the situation takes time and work. You have to balance your pet, your curses, your nukes, and your fears all in the right combination on a battlefield. This is not helped by having such dramatically different playstyles between the three talent trees. What DPS class do you feel you understand least? Rogues, followed by Enhancement Shamans. I literally have no idea what the different talent trees mean for Rogues, and I flail about on my Enhancement Shaman to the point where it’s embarrassing. What add-ons or macros do you use, if any, to aid you in dps? Ha! This question I can answer quickly! I have done fairly comprehensive reviews of my addons and macros, so go there for more answers. The quick list of addons is: DoTimer, MikScrollingBattleText, Quartz, and SaySapped. SaySapped is an awesome, lightweight addon that you really should have. It announces via /s that you have been Sapped, which is absolutely fantastic when defending a node with others. What stat to stack, and why? Oh boy! Another one I’ve already posted on! Since I wrote that post I have revised my thinking on gear priority, and that Resilience doesn’t always trump Stamina. I swapped out my Platinum Disks (with +190 Resilience) for the Brewfest Stamina trinkets (+340 Stamina) and found the extra 4k life instead really helped my survival better than 900+ Resilience. I’ve further augmented this in the Demonic Brutality build so that, with Sacrifice and Soul Link active, I have an effective health of 38k, which means I can afford to wait for the Rogue to finish stunlocking me before returning fire. But other than those minor changes, I still what I wrote holds true. The search for the perfect interface with World of Warcraft is much like the search for pink Elekks: both are goals that really only exist in your mind. The highly customizable WoW interface leads users towards finding a balance of changes to suit their needs. With that customization, however, comes an onslaught of choices that players have to make about how their game looks. And that tyranny of choice can sometimes be overwhelming. I’ve received a lot of requests on Twitter to share my UI and keybindings for PvP. I totally understand why people ask this; seeing how other players function inspires me in trying to optimize my interface with the game, of trying out new things, of thinking of ways to arrange functions that work better than the default, and better than what I have now. I know I can always improve my layout. Maybe looking at mine will help you with yours. TL;DR version: this is my UI. There are many others like it, but this one is mine. Any consideration of UI should really start with the very basic elements of the user’s interface, starting with the input devices. My UI is completely based upon the limitations of my computing setup, where I play, and how I control my characters. Your UI should take your setup into account, too. I don’t know what your setup is like, but mine is space-constrained. I do not have a numberpad, or extended keyboard. I have a small screen (13″) so space is at a premium. I have a touchpad, but vastly prefer the trackball for Warcraft, mostly because the trackball allows for easy right-clicking. The touchpad requires an Option-Click and that is cumbersome, both in terms of time and muscle strain. I know most players don’t like trackballs, and that most players prefer to not play on laptops. But that’s okay! I’ve got what I’ve got. Yes, there are a lot of sleek rigs, cool mice and great keyboards out there. If those are your thing, try them out. For me, with all the locations I play in, an external keyboard is not possible. While the trackball is not something I like lugging around the house, I found the cramping in my hands and difficulty in moving without it to outweigh the extra weight. So the trackball goes with the laptop now. Be honest with yourself when assessing your input methods, and don’t worry so much that the devices are holding you back until proven otherwise. Before I show a single screenshot of my UI, I need to talk about keybinding. My UI doesn’t make any sense without knowing how my keys are mapped out. The title of this article gives away that I am an avid keybinder. I bind everything that could be useful in combat to a key; there is very little clicking when I fight. Some people can click icons effectively in combat — I am not one of them. I think the improved reaction time you get from keybinding is essential to success in battlegrounds, Arena, and most PvE encounters, too. I play with my left little finger resting on the tab key and my right hand on the trackball. (Yes, I tab target, I used to play affliction.) The tab key provides an anchor for me to put three fingers on the 1, 2, and 3 keys, and my thumb on the space bar. The following picture lays out degrees of movement required to hit certain keys. Essentially, I consider my WoW keyboard as a one-handed input device, all radiating out from the Tab key. Here’s how I think of each zone. Dark red (Tab, 1-3, Q-E, Space) are no motion at all (or very little motion) and are therefore my primary action keys. On my warlock, these are things like Immolate, Incinerate, Conflagrate. I am hammering these keys EVERY combat. Pink keys require minor reach, and so are filled with useful spells and abilities. These will usually see some use in most combats. Orange keys I can stretch to reach but don’t have to leave the Tab key, so they are more infrequent items. Yellow keys require me to lift off of the Tab key and are infrequently-used abilities. Blue keys are system keys and not used in combat. White keys are movement keys, used as backup and for special modifiers (mounting, autorun). This layout evolved from my original setup, which used the arrow keys to move and 1-10 to cast. The left hand became my primary casting hand, while my right hand would move with the arrow keys. (, and . were originally bound to strafing, actually.) With the introduction of the trackball I realigned the keyboard for one-handed use, and only use two hands when typing text. Once I had the keyboard divided into zones, I quickly noticed that I did not have enough room to bind all my abilities and the default system commands. This was a big challenge for me to overcome; I couldn’t accept that it wasn’t necessary to have the PvP pane keybound, for instance. The ASDW movement keys stuck around for a long time, but eventually, the need to have keys available won out. You only really need a few system functions available. Experimentation helps determine what ones you really need. The hardest part of keybinding is not the honest assessment of your input devices and how you interact with them, honestly. Organizing and mapping out your keys is the most daunting part of the process. Trying to organize them logically is tough. Dual specs make it tougher, since now the same character can have two different keybinds. And alts? Trying to map out the keys on my alts made me cry. The keys to managing all this is priority and consistency. Priority is grouping your most important spells where your fingers are, and consistency is keeping similar functions in similar locations across characters. There are, essentially, three full action bars worth of keys here. Red keys are the top action bar on screen. Pink keys are the middle action bar on screen. Orange keys are the bottom action bar on screen. Yellow keys are “stance keys” off to the side of the screen. White keys are not displayed on screen. This is actual size, which means these buttons are all but unclickable. I display this so that I can remember my “yellow” key mappings, and to give me a visual representation of the global cooldown. Could I get away with hiding this? Probably, on my warlock. I do swap out some keys (-, =, p) if I need to have a quest item, bomb, or RP-GG keybound, but in general I have this list memorized. But then I wouldn’t be consistent between characters. And I like seeing the GCD spin. Here’s the breakdown for those who would like to know more. You may find some of my Warlock Macros post helpful in understanding what I mean when I have multiple functions assigned to each key. One of the trickiest things about dual-specs is keeping the keybindings consistent between your different specs. I try to keep everything consistent, except for the Red keys (1-3, Q-E), which I’ll dub the Red Zone. I’m fortunate in that I have two extremely similar specs (one is Destro PvP, the other Destro PvE), which is pretty straightforward to switch between. W: Pet Special is replaced by Curse of Doom. This is because PvE Destro relies upon the Imp, who does not need his special abilities mapped. E: Shadowfury is replaced by Rain of Fire. My PvE build doesn’t have Shadowfury, and I use Rain of Fire all the time in instances. Radically different dual specs present an interesting challenge. Limiting the changes to the Red Zone helps keeps them manageable, because you can focus on grouping actions together. These keys and macros, with appropriate timers and resets, allowed me to keep a boss fully dotted up with a minimum of changes. I could spam AoE with seeds on E, and execute at 25% life with Drain Soul with 3. The key to maintaining my sanity between the two, though, was keeping everything else exactly the same. Yes, that meant I had Drain Soul in two places. But it also meant that I could switch between the two without having to relearn the entire keyboard. I love my Red Zone keys. Now that I’ve gone on entirely too long about my keyboard bindings, let me talk about moving my character around. I’m a trackball user. It works like a 4 button mouse, so I can run, change camera positions, and strafe, all with different combinations of keys. I’m right handed, so it is easier for me to strafe left (using my thumb) than strafe right (using my pinky). I still have the arrow keys bound for movement. I used to use them all the time, but I honestly don’t think I’ve touched them in months. Mounting and dismounting quickly is very important in battlegrounds, which is one reason I have it in the Red Zone (`) as well as near the arrow keys (,). I do use Autorun (.) a lot while doing dailies, especially while flying… but it’s dangerously next to my dismount button. This has led to some unfortunate hilarity. Perhaps I should do something about this? After all this discussion about keybinding, you’re probably expecting my UI to be a carefully planned out minimalist work of art. It’s not. Actually, it probably looks a lot like yours. Playing on a 13″ screen has drawbacks. You have only a little space to put a lot of information that is dynamically changing. Your needs for one kind of fight might be different than another; certainly I wish I had less information in PvE and more information in PvP. Enough excuses. This is my screen UI, there are many like it — but this one is mine. Oh Bal, you tease. We were just there to help! Because they do not convey much information to me during a fight, my Bartender icons are very, very small on the screen. 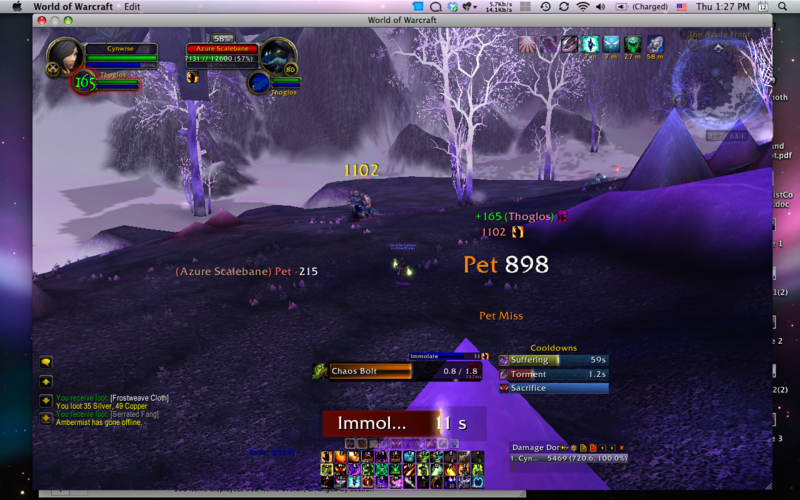 The pet bar is right on top of it, but I rarely click it, instead preferring to control my pet with the keyboard. As I look at my screen, I see several areas which need improvement. Cooldown management and debuff timers are spread across three different addons, each giving me a little different view on what I need to know. I should spend some time consolidating them and making it so that the information is consolidated so I do not waste so much space in displaying it. Combat text is in two places. I like the information associated with MikScrollingBattleText, but I also want to know the location of the damage — you can’t hide behind a wall from a Warlock who has dotted you up. I’d like to get the best of both worlds, but don’t know how yet. So, that’s my Warcraft interface. While it’s not perfect — or a pink Elekk — it gets the job done. I enjoy many aspects of Warcraft in addition to PvP: fishing, raiding, mortal combat in the Auction House, and yes, role playing. I don’t do a lot of role play online, but I do put a lot of thought into who my characters are. “I imagine that you encounter not only that stigma of being a warlock, but the added one of being a mercenary as well?” Arrens asked. Arrens pressed on. “I have found, however, that people are willing to move past their opinions when discussing the University. The Abbot and I meet on a regular basis now, and we are going to start a guest lecture exchange with some of the Brotherhood. The House of Nobles also has expressed interest in our work, with some members even going so far as enrolling some of their children in classes. It’s quite a status symbol, from what little I understand,” he said, watching the impact of his words on his fellow warlock. Anger, a little bit of avarice, and… something else. I hope you enjoy this little glimpse into what makes my warlock tick. I’m not sure how I missed linking this earlier, but WoW Insider had a good beginner’s guide to the Battlegrounds of Warcraft late last week. Zach Yonzon does an excellent job of not assuming you know anything about BGs, and is worth a read if you have never queued for Warsong Gulch.